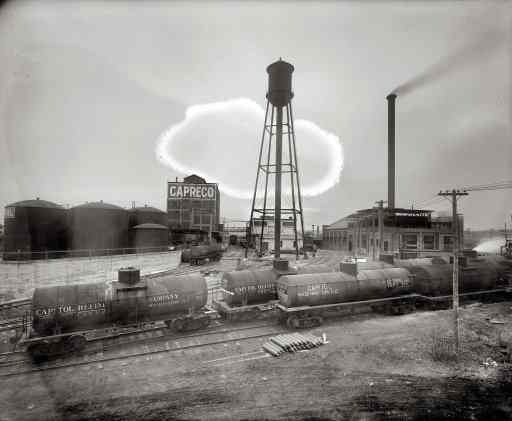 Capitol Refining Co. plant., "Relee, Alexandria County, just south of the highway bridge". On this site today: the Pentagon. Ilargi: It’s risky to say something like "The gears of capitalism are grinding to a halt". Many people will feel it is an attack on their very life and values, and react in anger instead of taking the statement at face value. And it is not 100% true, though it’s pretty close. It is possible to create a capitalist system without levels of debt and credit that reach into the heavens and beyond. Though, then again, one could make the case that all such systems must eventually lead to the same outcome. To continually allow borrowers to pay the interest rate on credit issued, ever more credit needs to be created. If you borrow $100 at 5% interest, you must somehow have $105 after a year. Which is not possible if only $100 has been issued. But let’s not dwell on waxing philosophically about theoretically possible systems too much, let’s look at the actual one we have. What is happening today can be summarized in a few words: credit is disappearing. The reason is that there are no lenders left who have sufficient collateral to justify writing new loans. Well, at least, not on the scale required to keep the machine running. And there is no way for the lenders to get more collateral. On the contrary, the assets they hold lose value fast, which cuts their collateral even further. The primary lenders can go to the Fed’s discount window, but in order to get credit there they have to give up ... collateral. For most people, all this merely conjures up the image of not being able to get a cheap enough mortgage or car loan they'd like in order to buy what they would wish to buy. That is where the notion of credit stops for the vast majority. Unfortunately, credit lubricates a far bigger machine than just the one that fulfills personal wishes. Our entire society runs on credit. And that means that the consequences of vanishing credit will hurt us much deeper and on a far wider scale than most of us imagine. The companies we work for cannot function without credit. The communities we live in cannot either: towns, counties, states and entire countries are all dependent on the ongoing availability of credit. And not just credit, but cheap credit: if you double or triple the interest rate paid at present, many, if not most, companies as well as governments - and individuals- will go broke. All parties in our economy, including you, have become accustomed to available cheap credit so much that our entire societies closely resemble the just-in-time delivery systems we all know. There’s nothing on the shelves anymore, there are no savings. In that sense, the statement is undoubtedly true. And if anybody complains, we can always specify it a bit more, and say that "The gears of OUR capitalism are grinding to a halt." Merrill Lynch & Co., Wachovia Corp., Lehman Brothers Holdings Inc. and the rest of the U.S. finance industry are about to find out how expensive credit has become. Banks, securities firms and lenders have a record $871 billion of bonds maturing through 2009, according to JPMorgan Chase & Co., just as yields are at their most punitive compared with Treasuries. The increase in yields may cost them as much as $23 billion more in annual interest versus a year ago based on Merrill Lynch index data. Higher refinancing expenses will restrict the ability of banks to borrow in the capital markets and lend, further cutting off credit to consumers and businesses and curbing what is already the slowest growing economy since 2001. Standard & Poor's said last week that it had a "negative" outlook on almost half of the 50 highest-rated financial institutions in the U.S. as of June 30, the highest proportion in 15 years. "The gears of capitalism are grinding to a halt," said Mirko Mikelic, senior bond fund manager at Grand Rapids, Michigan-based Fifth Third Asset Management, which oversees $21 billion in assets. "There is a tremendous concern over the banking sector and a scramble right now for capital." The Federal Reserve's quarterly lending survey released Aug. 11 said that more banks tightened credit for consumers and business borrowers. About 65 percent indicated they tightened standards on credit card loans over the previous three months, up "notably" from about 30 percent in the April survey. Investors on average demand yields of 4.14 percentage points more than what they can get on Treasuries to purchase bank bonds, up from the low last year of 0.76 percentage point in January, according to Merrill Lynch index data. Spreads on investment- grade rated bonds overall average about 3.14 percentage points. "The credit crunch is only now beginning because bank capital is so constricted by losses to date, that they will have to begin shutting off credit to households and corporations and that's when we get the defaults," David Goldman, the former head of fixed-income research at Bank of America Corp.'s securities unit in New York, said in a Bloomberg Radio interview. Goldman, who is now an investor, said he shut down a fund he ran because the markets are likely to become "brutal." Interest-rate derivatives imply that banks are even becoming hesitant to lend to each other amid the flood of maturing debt. They are charging each other a premium of 78 basis points over what traders predict the Fed's daily effective federal funds rate will average over the next three months. That's up from 24 basis points in January, and may widen to 85 basis points, or 0.85 percentage point, by mid-December, approaching the record levels set last year, prices in the forwards market show. Merrill Lynch, the third-biggest U.S. securities firm, has $26.5 billion of bonds maturing this year and $35.5 billion in 2009, according to data compiled by Bloomberg, the most of any broker. The New York-based company paid 2.25 percentage points more than the three-month London interbank offered rate to sell $1.2 billion of two-year floating-rate bonds in May. A year earlier, it paid a spread of 5 basis points. Wachovia, which reported an $8.9 billion loss in the second quarter, the widest in its history, has $34.5 billion of debt maturing in 2008 and 2009. New York-based Lehman, the securities firm that had more than $8 billion in credit losses in the past 12 months, has about $30.4 billion coming due by the end of 2009. Spokeswoman for Charlotte, North Carolina-based Wachovia Christy Phillips-Brown said the company has enough cash to meet more than three years of long-term debt maturities. "We have taken several actions to enhance liquidity, such as reducing the dividend expense reductions and a reduction in our balance-sheet growth," Phillips-Brown said. Danielle Robinson, a Merrill Lynch spokeswoman, said the firm doesn't comment on its funding strategy. Lehman spokesman Mark Lane declined to comment. Ian Lowitt, Lehman's chief financial officer, told investors on June 16 that the firm doesn't expect to return to the bond market this year and has "completed our funding plan for 2008." Because banks make money on the difference between their borrowing costs and the rates they charge on loans, any added debt expense is likely to eat into earnings, according to Diane Vazza, head of global fixed income research at S&P in New York. In response to a slump in demand for their bonds, financial firms, which have incurred $504 billion of writedowns and credit losses since the start of 2007, are selling assets such as mortgage securities and collateralized debt obligations at fire- sale prices to pay down looming maturities. Merrill Lynch in July agreed to sell $30.6 billion of CDOs at a fifth of their face value. Lehman is also exploring the sale of all or part of its asset-management business, Neuberger Berman LLC. Banks are also raising rates on certificate of deposits to attract cash from new customers, said Alex Roever, a short-term debt analyst at JPMorgan in New York. Wachovia, which has more than 55 percent of its balance sheet funded by core deposits, is offering the highest CD rates in the industry, said Richard Bove, an analyst at Ladenburg Thalmann & Co. in Lutz, Florida. "They want to escape the pressure of the funding markets," he said. Deposits at Merrill Lynch's bank subsidiaries and brokerage accounts rose by 21 percent to $100.5 billion in the year ended June 2008, company filings show. The flood of maturing debt is a byproduct of a boom in short-term bond issuance between 2005 and the first half of 2007 by financial institutions taking advantage of demand from money funds and some of the lowest borrowing costs on record. Banks sold $960.8 billion of so-called floaters between 2005 and 2007, according to JPMorgan. About $260 billion, or about 30 percent, of the debt coming due in the remainder of this year is floating-rate notes. "They wanted to borrow the money at the cheapest levels possible and floating-rate notes helped them achieve that," said JPMorgan's Roever. Merrill Lynch has $13 billion of floating-rate notes due this year, while Wachovia has $7.5 billion, the most of any commercial bank, according to Bloomberg data. Goldman Sachs Group Inc. and Morgan Stanley, the two biggest securities firms and both based in New York, have at least $5 billion maturing. The trouble now is demand from specialized money funds that readily bought the debt, swelling their assets under management to $200 billion in August last year, has evaporated amid their own losses. The funds, referred to as enhanced cash funds and run by firms such as Bank of America, now hold about $50 billion, according to Peter Crane, president of Crane Data LLC, a Westborough, Massachusetts firm that tracks money-market funds. Banks may be able to raise at most $110 billion in floating- rate notes, less than half the amount coming due, Roever said. Firms that can't raise enough funds by selling assets or attracting deposits will be forced to rely more on selling commercial paper and related money-market securities that typically mature in nine months or less, said Christopher Whalen, co-founder of independent research firm Institutional Risk Analytics in Torrance, California. That may reduce their ability to offer long-term loans, according to Whalen. "You can't build a banking business on short-term funding," he said. "Lending long and borrowing short is the classic mistake that led to all the big bank failures in the past." Potential downgrades of residential mortgage-backed securities pitched as some of the safest investments may force money managers and other holders to unload up to $469 billion in the bonds, according to one of Wall Street’s largest bond firms. The bonds represent about 30% of outstanding “AAA” securities backed by U.S. mortgages, Lehman Brothers said in a report dated Monday. The Lehman study comes amid heightened worry that eroding credit in mortgages, especially so-called “Alt-A” loans that required less proof of income or assets, will cause losses to even the safest portions of the bonds. Standard & Poor’s is reviewing ratings on mortgage bonds after revising its loss projections higher in July. “Valuations in the residential credit sector continue to languish as concerns about forced asset sales from banks, broker/dealers, and structured vehicles dominate,” Lehman analysts Rahul Sabarwal and Madhuri Iyer said in the report. Rating downgrades are imminent, they added. Rates of increase in delinquency for many Alt-A and prime jumbo U.S. mortgages last month have outpaced those on the subprime loans that helped spark the housing crisis, S&P reports showed on Friday. The erosion may open a new chapter of the credit crisis by hurting a more conservative class of investors that avoided more complex mortgage products – like collateralized debt obligations – that have caused the worst of the write-downs for banks around the world since 2007. Many of the securities are products of Wall Street mortgage fundings during the housing boom that took market share from Fannie Mae and Freddie Mac “agency” programs, and financed risky loans. But most of each bond was still rated “AAA” since junior investors agreed to shoulder greater risks. Downgrades to “AAA” bonds could be especially harsh for mutual fund money managers who are prohibited from holding securities rated below the top-tier, the analysts said. Those money managers may sell $64 billion of their $225 billion in “AAA” non-agency mortgage bond holdings as downgrades occur, they said. Other holders, including Wall Street dealers, insurance companies and banks, have more flexibility in dealing with the downgrades, and are less apt to sell, they said. Coping with higher capital requirements and funding costs that would follow downgrades is probably preferable to the severe loss that would be realized on a sale of the bonds, they said. After a year of mortgage market turmoil, “AAA” rated non-agency bonds are trading at 40% discount to their par value, they said. Lower-rated bonds already heavily tagged by downgrades are valued even lower, an investor said. Commercial banks have about $110 billion of their $380 billion in “AAA” non-agency bonds at risk, Lehman calculated. Non-U.S. investors hold $413 billion in the debt, and $118 billion is “at risk,” they found. Fannie Mae and Freddie Mac, the largest providers of funding for U.S. mortgages, hold non-agency MBS but downgrades do not affect requirements on their capital. The plan was simple earlier this year at most large companies where top brass and rank-and-filers found themselves holding worthless stock options: Wait and hope investors send prices back up. Now it may be time for Plan B. Stock options are currently underwater at nearly 40% of Fortune 500 companies, compared with about one-third that had worthless options during the first quarter, according to data compiled for Financial Week by compensation consultants Steven Hall & Partners. And many of those options are well into the abyss: One in every 10 companies now has options that are more than 50% underwater. Compensation consultants say an increasing number of companies are considering dealing with their now-worthless options, either by repricing them or exchanging them for newly issued restricted stock. While devising a plan that flies with shareholders—themselves reeling from huge stock losses—won't be easy, some experts say companies have little choice but to try. After all, more companies are watching their stock options sink deeper and deeper, making the chances for getting back “in the money” seem even more bleak than they did just a few months ago. The underwater issue is relatively industry-specific and is largely affecting the companies that have been hardest hit by the credit crunch and economic downturn, companies, Ms. Meyer added, that have the greatest need to keep their most talented workers. Not surprisingly, the corporations whose options are the most deeply underwater—which occurs when a company's stock price dips below the exercise price of an option—are largely financial firms, although automakers, retailers and tech companies also account for a significant portion. Five of the 10 most underwater companies are financial services firms, and that group would have been larger if Bear Stearns and Countrywide Financial—the two most underwater financials in the first quarter—were still operating independently. Their departure from the Fortune 500 leaves Freddie Mac as the company with the most deeply underwater options—roughly 90% below its weighted average exercise price on Aug. 15, when its stock was trading at $5.85 a share. The mortgage lender's shares have lost almost 90% of their value since the end of the first quarter. Its sister government-sponsored entity, Fannie Mae, and giant savings and loan Washington Mutual aren't far behind, as both now have options that are 89% underwater. Spokesmen for the three firms could not offer any details on how, or if, they will attempt to address their option pricing dilemmas. Some companies with options deeply underwater may consider repricing them at a lower exercise price. This can be a tricky undertaking, given that it now requires the approval of shareholders. Yet that isn't deterring at least one firm, Palo Alto, Calif., technology company VMware, from seeking shareholder approval to reprice options. In a July 17 letter to employees, VMware CEO Paul Maritz revealed that the company's board had approved a proposal to allow workers to ex-change out-of-the-money options for new options. During VMware's second-quarter earnings conference call, Mr. Maritz said the proposal “obviously went a long way to addressing concern” about morale and retention. VMware is holding a special shareholder meeting to approve the exchange on Sept. 9, confirmed spokeswoman Mary Ann Gallo. An alternative to trading in underwater options for options with new exercise prices is to swap them for restricted stock, Mr. Harsen said. This can restore the alignment of interests between workers and investors, which could help corporations get the green light from shareholders, particularly if a company's stock has performed poorly for a prolonged period of time. “There's a lot of talk about this right now,” said Ira Kay, global director of compensation consulting at Watson Wyatt. “It's a bear market, and if you reprice the options now, there's still a chance they could go underwater at some point in the future. Employees want something that has some value.” Mr. Kay predicts that a “few dozen” large companies might swap underwater options for restricted stock over the next 12 months. On Friday morning, at 9.30am, something changed. One of the scariest words in the orthodox economic vocabulary lost its taboo status. Britain is almost certainly already in the first stages of recession. That much became clear after the Office for National Statistics revealed that, rather than growing slightly in the second quarter of the year as was previously thought, the economy stagnated for the first time since the early 1990s. The majority of leading City economists think the next move will be down, and that a recession is all but inevitable. The big worry has shifted from the R-word to the D-words: depression and deflation. Both are a real - if remote - possibility, and much depends on the response of both the Treasury and the Bank of England if the UK is to avoid them. It may even be in their power to prevent this from turning into a deep 1990s-style recession instead of the preferable shallow dip in performance. At the heart of the problem is the poor state of the UK's household balance sheets. The fact is that few people understand the true scale of Britain's consumer debt bubble, still less the scale or length of the downturn necessary to turn it around. The household deficit - the difference between household spending and income, expressed as a percentage of GDP - has fallen below the levels it reached at the end of the late 1980s Lawson boom. The figures are analogous to the saving ratio - which recently plunged to a 50-year low, indicating that families are having to dig deep into their savings in order to finance everyday life. According to Ian Harwood, former leading economist at Dresdner Kleinwort, this indicates that the coming recession could be of a scale that matches, if not exceeds, the early 1990s slump. "UK consumer spending looks very vulnerable and retrenchment could be both severe and long-lived," he said. "How bad will the UK recession get? It's difficult to know. The fact that excesses in the housing market and in consumer spending look as if they have far to unravel suggests that it is likely to continue well into 2009." The scale of the debt bubble, however, raises memories of Japan before its lost decade. The Bank for International Settlements recently raised the spectre of deflation in its Annual Report, and it is not hard to envisage inflation dropping back so sharply that it comes in below target, causing consternation to policymakers. There is no telling whether the UK could slip into negative price territory, although one reassuring factor is that the corporate sector has been far more open with its financial problems than the Japanese leviathans were back in the late 1980s. However, the longer the Bank of England leaves borrowing costs high, the greater the chance that inflation undershoots its target. The greater the chance, too, that the recession lasts longer, and perhaps even becomes entrenched. One of the first lessons is that recessions - particularly those that have their origins in the consumer sector - tend to last longer than people remember. According to Malcolm Barr of JP Morgan: "The early 1980s recession saw the level of GDP fall 6pc from peak to trough, while the early 1990s recession saw a 2.5pc fall. In both cases, once the gross domestic product stopped contracting, it took more than a year before growth recovered to a trend pace or above." Yet few City economists are forecasting anything more than two or three quarters of contraction. What they, including Mr Barr, are expecting is "recession-lite". But is such a "soft landing" feasible - given that the scale of the excesses this time around are even greater than in the late 1980s and early 1990s? The fact that, in the past few months alone, house prices have started to tumble faster than ever before is ominous, given that until last year most economists were confident the housing market would enjoy a soft landing. But look more closely at even the more bullish forecasts and they spell out that it will be a difficult few years for the consumer. Consumer spending, already in reverse according to the ONS, will continue shrinking. The main source of impetus for wider growth is not the consumer but the corporate sector. According to Stephen Lewis, an economist at Insinger de Beaufort, a rise in exports, buoyed by the recent drop in the pound, will probably "come to the rescue", so that a technical recession may even be avoided. "But this misses the point," he said. "To businesses and consumers, it could feel like a recession as their spending power will be constrained, profits will shrink and unemployment will rise." Vicky Redwood of Capital Economics agreed, saying: "Even if we avoid a technical recession, it's going to feel pretty recession-like, with sharp rises in unemployment and falling real incomes." Mr Lewis said the slowdown was more accurately viewed as a "rebalancing of the UK economy" away from debt-fuelled consumption and into the exports and industrial sectors. "Opinions differ, even on the MPC, as to whether such a rebalancing is necessary, or whether the UK economy could go on relying on credit-fuelled consumption for its GDP growth. Those who take the latter view advocate US-style slashing of interest rates aimed at reviving the credit markets." There is little doubt which option the Government would prefer, but the Bank of England's recent actions, keeping interest rates on hold at a restrictive 5pc and even hinting that it would be prepared to raise them, suggest it may be in favour of rebalancing. Governor Mervyn King has frequently bemoaned the emphasis placed on the financial services sector's economic output in recent years, which has gone hand-in-hand with the credit boom. Another mildly reassuring fact is that whereas in the early 1990s corporate sector balance sheets were almost as debauched as those of British households, this time the corporate deficit is far more healthy. Nevertheless, without funding there is little that many can do to stay afloat, and monetary statistics from the Bank show that the corporate liquidity ratio has dropped to the lowest level since the last recession. And this is the joker in the pack. The credit crisis is putting extra pressure on consumers and businesses when they are already suffering. Worse still, its impact on other economies means that the appetite overseas for Britain's exports will not be as prodigious as many economists hoped. Economists rarely, very rarely, forecast outright recession, partly because they are by nature cautious, partly because such a call gets disproportionate publicity and partly because the way their economic models are designed makes a negative projection statistically unlikely. The fact that so many City minds now think a recession is likely is highly significant. The hope is that nothing worse is lurking round the corner. An economic adviser to Democratic presidential candidate Barack Obama said on Monday that U.S. financial regulation needs modernizing, but hedged on how big a role to give the Federal Reserve. Laura Tyson, former chair of the Council of Economic Advisers in the Clinton administration, said that in the Obama campaign’s view, “We need to look seriously at how to modernize our regulatory structure.” She said in an interview with Thomson Reuters that she personally believes the Fed failed to crack down on subprime mortgage lending in recent years. That needs to be taken into account when deciding whether to give the central bank a primary role in a revamped system, said Ms. Tyson, seen by some investment group strategists as a contender for Treasury secretary in an Obama administration. “What we have learned from the past two years ... is that the old form of regulation is broken,” Ms. Tyson said. “The exact form of the reform is something that we are learning about,” she said. The Fed has already broadened its role in ensuring stability by engineering the recent sale of investment bank Bear Stearns and helping other investment banks deal with the sharpest U.S. housing market slump since the Great Depression. U.S. Treasury Secretary Henry Paulson has suggested that the Fed’s role in regulating the system should be strengthened. Federal Reserve Chairman Ben Bernanke suggested on Friday at a Fed conference that financial supervision be revamped to take into account the health of the entire system, broadening the mandate of regulators and supervisors. Any financial oversight revamp is highly unlikely to take place until after a new president takes office in January. Home prices fell a record annual 15.9 percent in June, but the monthly rate of decline slowed from May which suggested the decimated housing sector may be stabilizing, according to Standard & Poor's on Tuesday. "While there is no national turnaround in residential real estate prices, it is possible that we are seeing some regions struggling to come back, which has resulted in some moderation in price declines at the national level," said David Blitzer, chairman of the index committee at S&P, in a statement. The S&P/Case-Shiller composite index of 20 metropolitan areas slipped 0.5 percent in June from May, bringing the measure down 15.9 percent from June 2007. The month-over-month drop in the 20-city index was the smallest since July 2007. In June, nine of the 20 cities tracked showed home price increases compared with seven in May, S&P/Case-Shiller said. The 20-city figures came in less weak than what analysts polled by Reuters had expected. S&P said its composite index of 10 metropolitan areas slipped 0.6 percent in June versus May, for a 17.0 percent year-over-year drop. On a quarterly basis, single-family home prices plunged a record 15.4 percent in the second quarter from a year earlier, surpassing the steep drop in the first quarter, While the pace of price decline slowed in June, the housing market, which has been a severe drag on the U.S. economy, remained weak. Not one regional market has showed a positive return over the past 12 months and seven of the metro areas are reporting declines of more than 20 percent. Las Vegas remained the most dismal housing market, showing a 28.6 percent annual decline in June. Miami and Phoenix were the next weakest markets, recording 28.3 percent and 27.9 percent annual price drops, respectively. Sales of newly constructed U.S. single-family homes in July were lower than economists expected but rose from a June pace that was the slowest in nearly 17 years, a government report showed on Tuesday. Economists polled by Reuters were expecting to sales to remain unchanged at the 530,000 annual pace first reported for June. The actual sales pace in July of 515,000 climbed from the revised June level of 503,000, which was the lowest since a 487,000 pace in September 1991. The inventory of homes available for sale shrank 5.2 percent to 416,000, the lowest since October 2004. The July sales pace put the supply of homes available for sale at 10.1 months' worth. The median sales price rose slightly to $230,700 from $230,100 from June, but was down 6.3 percent from a year earlier, the government said. U.S. stocks and the dollar moved higher after the home sales data and a stronger-than-expected consumer confidence report. U.S. government debt prices extended losses after the data. Compared to a year ago, home sales were off 35.3 percent. Only Northeast sales rose from a year earlier, up 4.2 percent, while all other regions had double-digit declines. The data comes a day after a report from a realty trade group found that the pace of existing home sales in June rose 3.1 percent to a 5 million-unit annual rate while prices slipped and the housing overstock swelled. Ilargi: The market makers are going for the Book of Tricks. Buyers of credit-default swap contracts that protect against losses on Fannie Mae or Freddie Mac subordinated debt may not get paid immediately if the mortgage-finance companies were to defer interest payments as part of a government bailout, according to Bank of America Corp. While a failure to make the payments permits credit-default swap buyers to cash in on their protection, Freddie and Fannie subordinated bond indentures allow interest to be deferred for as long as five years, or until maturity, if capital cushions breach certain thresholds, Bank of America strategist Glen Taksler in New York wrote in a note to clients yesterday. Assuming Fannie Mae meets a maturity on $1 billion in subordinated notes next week, Taksler wrote, it would be 2011 before credit-default swaps would be triggered by deferred interest payments. Credit-default swaps, used to speculate on corporate creditworthiness or to hedge against losses, pay the buyer face value in exchange for the underlying securities or the cash equivalent should a borrower fail to adhere to its debt agreements. Subordinated debt sold by Fannie or Freddie allows for interest to be deferred if capital cushions fall below minimum levels required by regulators and the Treasury buys the company's debt at the company's request, according to bond indentures. Payments also could be deferred by one of the companies if its capital fell below 125 percent of so-called critical capital, defined as half of minimum capital. U.S. Treasury Secretary Henry Paulson last month won approval to pump unlimited amounts of capital into Washington- based Fannie and Freddie of McLean, Virginia, which guarantee or own about $5 trillion of the $12 trillion in U.S. home loans. The companies would have to agree to capital injections. Fannie had $47 billion of capital as of June 30, according to company filings. Its minimum requirement was $32.6 billion, rising to $37.5 billion with a surcharge required by its regulator, the company said. Freddie's capital stood at $37.1 billion, compared with a minimum requirement of $28.7 billion, rising to $34.5 billion with the surcharge, according to filings. A failure to pay interest beyond what's allowed in the indentures could trigger credit-default swaps on both subordinated and senior debt, Taksler wrote. The companies combined had $15.6 billion in subordinated debt at the end of June and $1.6 trillion in senior debt. A capital injection by the government, on its own, isn't likely to trigger credit-default swaps, he wrote. "Such an injection would effectively make the government an owner of the agencies, without taking control of day-to-day operations," Taksler wrote. "But, to be clear, an actual opinion would depend on all the information available at the time of a potential event." Such situations are a "gray area," he said, "and it may be possible to obtain different -- or even opposite -- interpretations from different sources." Credit-default swaps could be triggered under other scenarios, such as coming under the control of a conservator, the Bank of America report noted, citing the International Swaps and Derivatives Association's 2003 definitions for the contracts. The government could put the companies into conservatorship if the companies fell below critical capital levels. Lehman Brothers Holdings Inc. may set up a company funded by outside investors to buy some of its mortgage assets, aiming to dispel concern the firm faces crippling losses, people familiar with the discussions said. Investors in the new venture would also manage the holdings, which are linked to commercial real estate, the people said, declining to be identified because the proposal hasn't been made public and no decision has been made about how to proceed. The New York-based firm had about $40 billion in commercial-mortgage assets as of May. Lehman, the largest underwriter of mortgage bonds last year, has been trying to reduce assets linked to that market as demand dried up and prices plummeted, generating more than $8 billion in writedowns and credit losses. BlackRock Inc., the largest publicly traded U.S. money manager, is considering a purchase of some of Lehman's commercial mortgages, people familiar with those discussions said last week. "They need to reassure investors by offloading some of these assets," said Mayiz Habbal, an analyst at Boston-based research firm Celent. "Lehman isn't negotiating from a position of strength." The company has lost almost 80 percent of its value on the New York Stock Exchange this year as Chief Executive Officer Richard Fuld, 62, tried to reassure investors Lehman won't suffer the same fate as smaller rival Bear Stearns Cos. New York-based Bear Stearns collapsed in March when creditors and investors balked at doing business with the firm. "There's no question that selling their troubled assets will help," said Michael Holland, chairman of Holland & Co., which manages $4 billion of assets. "But how much will it help? We're in tough times, and it doesn't look like things are going to get any better any time soon." Lehman, the worst performer on the 11-company Amex Securities Broker/Dealer Index this year, gained 25 cents, or 1.9 percent, to $13.70 in composite trading at 12:29 p.m. Lehman may contribute some of the equity for the new venture so it could benefit should asset prices recover, the people familiar with the talks said. UBS AG, Switzerland's biggest bank, and Merrill Lynch & Co., the third-largest U.S. securities firm, also discarded mortgage assets in transactions in which they loaned buyers most of the money for the purchases. BlackRock and other investors put in $3.75 billion of equity to buy $15 billion of mortgages from UBS, with the rest borrowed from the Zurich-based bank. In addition to its commercial real-estate holdings, Lehman had about $24.9 billion in residential assets as of the end of May. The firm may decide to dispose of both types of mortgage holdings in an outright sale, though no final decisions have been made regarding what form a transaction will take, the people familiar with the discussions said. Lehman has also been in talks with potential investors who'd buy a stake in the firm or its asset-management unit as a way to offset losses incurred while it's disposing of assets. Private-equity firms including Blackstone Group LP and Carlyle Group expressed interest in the business, people familiar with the matter said last week. Kohlberg Kravis Roberts & Co. has emerged as the frontrunner while Blackstone has dropped out, CNBC television reported yesterday. Korea Development Bank said last week it was considering an investment in Lehman. China's Citic Securities Co. and the Korean bank ended talks to buy as much as 50 percent of Lehman because the price the firm demanded was too high, the Financial Times reported last week. Lehman posted a $2.8 billion loss in the second fiscal quarter, which ended May 31, amid speculation that it may have further writedowns on mortgage-related assets. Fuld in June removed his associate of 30 years, President Joseph Gregory, 56, and replaced him with Herbert "Bart" McDade, 49, who had run fixed income and equities. Fuld, McDade and other members of the management team are racing to conclude a deal with potential investors before the firm reports earnings next month, the people familiar with the discussions said. The CEO is running out of time to show he can turn things around, said Richard Bove, an analyst at Ladenburg Thalmann & Co. in Lutz, Florida. "People inside the company are in open revolt while people outside are losing confidence in him," Bove said in an interview. "The quarter is almost over and he has failed to sell bad assets. That's not acceptable." Lehman's third quarter ends this week, and the firm typically announces earnings in mid-September. Bear Stearns's downfall came in part because the firm was constantly in the news, spooking clients and lenders, said Bruce Foerster, president of South Beach Capital Markets in Miami. "Lehman needs to get out of the spotlight if it's to survive," Foerster, a former Lehman managing director, said in an interview. "Selling most of the bad assets and a big capital infusion might help them achieve that. They need to do whatever it takes to stop being speculated about." Freddie Mac's commitments to buy mortgage bonds fell $324 million in July, a telling effect of the mortgage giant's cratering stock price during that month on the rest of its business. Fannie Mae, the sibling government-sponsored enterprise, managed to boost its net commitments by $16.6 billion in July. However, Fannie did lag Freddie through spring on the pace of addition to its portfolio by tens of billions of dollars. While this decline in their purchase of mortgage bonds is in line with expectations, another note of concern was the rapid increase in single-family delinquency rates. Freddie's delinquency rates shot up to 1.01% from 0.71% at the start of the year. While these numbers are still low, it represents an increased stress on the company from its holdings of Alt-A and other types of mortgages lent to borrowers with risky credit profiles. Fannie's serious delinquency rate rose to 1.36% from 1.06% in January this year and versus 1.3% in May. Both Freddie and Fannie haven't been big buyers of the mortgage bonds they guarantee for their retained or investment portfolios since July. Mid-summer, investors lost confidence in the two government-sponsored enterprises' financial stability to weather the credit crunch without a stronger statement of government support. To allay these concerns, Congress passed a measure that granted the Treasury authority to prop up the two companies, including unlimited infusion of funds, should the need arise. Both mortgage finance companies, however, continue to operate in capital-conservation mode, and spared little cash to support the mortgage bond market. Their total purchases of less than $16.3 billion is significantly less than their commitments to buy in June - $34.7 billion from Freddie and $20.4 billion from Fannie. Freddie, during its second-quarter earnings conference call earlier in the month, noted that it plans to keep its growth rate flat for the rest of the year. So far this year, Freddie's retained portfolio has increased by 18.4%. This is contrary to the plan policymakers came up with this spring. At that time, several government measures sought to set Fannie and Freddie as the backstop support for the housing market after it dropped to historic low levels. The intent was to keep the mortgage bond market stable and have consistent buyers since risk premiums or spreads paid on these bonds over comparative Treasury yields are used to determine the interest rate mortgage borrowers pay. Market participants say what Freddie and Fannie may invest the rest of the year would depend on whether and how much capital the mortgage-finance companies are able to raise. Meanwhile, Freddie's issuance of guaranteed participation certificates and structured securities increased by $21.7 billion in July, down from June's $43.9 billion increase, Freddie reported Tuesday. Total issuance increased 1.1% in July, and 8.5% year-to-date. The agency expects to see an increase in the range of 10% for the year, which won't be as robust as its 17.7% in 2007. Much of the agency's increase started last summer, after many private label issuers grew cold on the market, leaving government-sponsored agencies like Fannie and Freddie to pick up the slack. Freddie's total mortgage portfolio rose 4.2% in July. The duration gap, a measure of the portfolio's sensitivity to interest rates, averaged zero months in July. Fannie, on the other hand, in July increased its gross mortgage portfolio at a 14.4% compound annualized rate, bringing the tally to $758.112 billion. This represents the total of the home lender's loans and mortgage-backed securities held in its portfolio. Fannie Mae's book of business grew at an annualized compound rate of 3.5% in July, and 9.6% year-to-date. Total Fannie Mae issuance of mortgage bonds was at $36.6 billion in July, down from $55.5 billion in June. Issuance of Fannie Mae MBS and other guarantees rose at a compounded annualized rate of 3.6% during the month. Fannie's duration gap, a measure of the portfolio's sensitivity to interest rates, averaged plus one month in July down from two months in June. Voters aren't likely to hear much before the election about plans to end government support for two giants in home finance, Fannie Mae and Freddie Mac. Yet like house prices, the federally backed entities are on the skids – as is the whole idea of Washington continuing to aid investment in a market often treated like a big bet. But a political campaign is the perfect time to ask candidates what should become of Fannie and Freddie – and the implied federal credit they enjoy that allows them to borrow at low rates, buying and reselling "bundled" mortgages on global securities markets on behalf of private investors. Politicians don't want to face such an issue, as it strikes at the heart of federal support for a now-precarious home mortgage scheme that benefits mainly the middle class. But such a question must be asked as share prices for these "government-sponsored enterprises" have plummeted in recent weeks and the two face difficulty in selling debt. The crisis over their existence may come to a head before November. The primary cause is uncertainty over the vulnerability of their multi-trillion portfolio to the rising number of home loans that never should have been made to risky buyers. But since July 30, when Congress gave the US Treasury a blank check to buy a controlling share, if need be, in the two if they falter, investors have also become uncertain over how much of a haircut they would take if – or once – Treasury takes over these enterprises. The authority given for a potential purchase of Fannie and Freddie is turning into a self-fulfilling reality. Famed investor Warren Buffet says, "the game is over." Meanwhile, the big secret is Treasury's post-takeover plan for the two and what Congress also might expect. Will the two entities be temporarily nationalized, broken up into small companies and sold off – with no implied federal credit? Will a much-smaller version of the two be created to support home-buying for only the poorest Americans? These are not small questions for the housing and financial markets. Fannie and Freddie own or guarantee about half of the $12 trillion mortgage market, not so much out of public need but because they've learned how to lobby Congress to keep them growing – on behalf of shareholders. Taxpayers need answers if billions are to be required in a potential crisis or if Congress and Treasury plan to maintain Fannie and Freddie in their present form. Yet debate in the campaign is negligible. The Depression-era days when a market for reselling mortgages needed federal help are over. And Fannie and Freddie don't lower interest rates enough to justify the risk they pose to financial markets if they were to implode. Nor should a government-backed entity be allowed to use its profits to lobby lawmakers on behalf of shareholders or be able to pressure the housing industry into lobbing on its behalf. Americans have been misled by decades of government help for mortgages to count on their homes as a piggy bank rather than simply as a house to live in. Now a historic decline in prices is a wake-up call for a debate on whether home ownership deserves to be a drain on tax dollars. Fannie and Freddie are ripe for such a debate. The crisis gripping Fannie Mae and Freddie Mac spread across the financial system yesterday as JPMorgan Chase warned of a possible $600m (£323m) loss from its holdings of preferred shares in the two mortgage financing groups. JPMorgan said it would write down the value of its $1.2bn of preferred shares in Fannie and Freddie by half. Banks and insurers own most of the $36bn in preferred stock in Fannie and Freddie, and JPMorgan's announcement will raise pressure on other holders to make similar writedowns. Preferred shares are a hybrid of debt and equity and are attractive to investors because they pay interest above equivalent debt instruments. No other bank has written down the value of its Fannie and Freddie preferred shares, and only a few have revealed their holdings. Philadelphia-based Sovereign said last week that it held more than $600m in Fannie and Freddie preferred stock. In a regulatory filing, JPMorgan said that since June, the value of its preferred shares in Fannie and Freddie had "declined in value by approximately an aggregate $600m". The bank said that the precise amount of the losses would not be known until the end of the third quarter. The value of preferred stock in Fannie and Freddie has tumbled to less than 50 cents on the dollar in recent weeks on fears a US Treasury rescue could wipe out holders of preferred as well as common stock. The Treasury was granted powers late last month to extend its credit lines to Fannie and Freddie and invest in their debt and equity. The JPMorgan news came after Freddie easily sold $2bn of short-term debt, helping to reassure investors that Freddie and Fannie still have access to fund their operations without a government rescue. Freddie and Fannie rose 17.08 per cent and 3.8 per cent respectively, halting last week's sell-off even as US indexes finished sharply lower yesterday. Fannie and Freddie both lost about 40 per cent of their value last week. Freddie's auction of $2bn in three- and six-month bills drew strong demand as buyers were attracted by higher rates. Ilargi: As JPMorgan’s takes a more realistic look at its Fannie and Freddie -preferred- shares, let’s see the rest of all the big shareholders do the same. We can be certain that even JPM’s 50% haircut doesn’t tell the whole story; after all, many analysts now agree that the fair value of the two is negative. But it’s a start. So let’s go. Well, forget it: these shareholders, which include hunderds of regional US banks, thrifts and funds, will fight till the bitter end to prevent marking F&F to market. Simply because, for many, doing so would BE their bitter end. Makes me wonder why JPMorgan does it, at the end of August. What’s their interest in seeing small banks fail? Would they perhaps do it because they’d like to buy up billions of dollars in assets for pennies on the dollar? Nah, they wouldn’t, that would be mean, wouldn’t it? JPMorgan Chase & Co said the market value of its investments in Fannie Mae and Freddie Mac preferred stock has dropped by half to $600 million this quarter. In a filing with regulators on Monday, the bank said the decline could affect its earnings. The precise amount of losses for the third quarter is difficult to determine, given the oscillations in the preferred shares' values, it said. Fannie Mae and Freddie Mac have seen their share values plummet amid the credit market crisis, which has triggered questions about whether they have enough capital. Fannie shares have dropped nearly 90 percent this year, closing at $5 on Friday, while Freddie shares have fallen over 90 percent and closed at $2.81. While write-downs at JPMorgan have been modest compared with other banks, the company said earlier this month it had lost $1.5 billion in July and the first third of August, after wider credit spreads and deteriorating liquidity hit the value of its mortgage-backed securities and loans. J.P. Morgan Chase said today that its holdings of Fannie Mae and Freddie Mac securities have lost about half their value so far this quarter—and that it can’t yet determine how much it will write off. J.P. Morgan owns $1.2 billion worth of Fannie and Freddie perpetual preferred stock, it said in a securities filing. Due to “significant volatility” in the market, the company said, the value of the shares has dropped by about $600 million so far this quarter. “The precise amount of losses that may be incurred on these securities for the third quarter is difficult to determine,” according to the filing. Mr. Caldwell and his colleagues have been kept especially busy recently asking banks to reveal how much they have in Fannie and Freddie shares. By some estimates, banks may hold as much as half of the roughly $36 billion in Fannie and Freddie preferred equity. Analysts agree that the problem is worse on a relative basis at smaller regional banks than it is at larger banks. Companies are not required to disclose their holdings, but some have already taken write-downs this year. While J.P. Morgan’s loss is quite manageable, Mr. Caldwell noted, at only 1% of its tangible capital, smaller regional banks may not be able to recover from dramatic losses. He wrote in a note to clients today that among the larger banks that he covers, the largest exposure is at M&T Bank, a $66 billion-asset company in Buffalo, N.Y. M&T has $120 million in exposure to Fannie and Freddie preferred shares, or 4% of its tangible capital, according to Mr. Caldwell. Meanwhile, two of the biggest U.S. bond investors said they would be willing to be involved in efforts by Fannie and Freddie to raise additional capital. Bill Gross, chief investment officer at Pimco, and Dan Fuss, vice chairman of Loomis Sayles, said they would take part in capital raising by the GSEs—as long as the U.S. Treasury participates in the deals. Ilargi: And now for a message from left field. Fannie Mae and Freddie Mac, the two biggest U.S. mortgage finance giants, have enough capital to absorb probable losses through the end of the year, according to Citigroup equity research. Estimated third and fourth quarter revenue of $7.5 billion for Fannie Mae and $5.5 billion for Freddie Mac would cover likely losses of $1.5 billion and $1.2 billion, Citigroup said in slides for a conference call on Tuesday. The excess capital over minimums in the second half of the year would thus total $20.3 billion for Fannie Mae and $12.7 billion for Freddie Mac, the slide presentation obtained by Reuters shows. The companies have come under intense scrutiny over the past few months on investor speculation that mortgage losses would cause shortfalls in capital, and lead to a bailout by the U.S. Treasury. Fannie Mae and Freddie Mac shares have tumbled since May with analysts contending a taxpayer-funded rescue could leave shares worthless. Citigroup analyst Bradley Ball in an August 22 report asserted that shareholder interests would likely be preserved despite increased chances for "extraordinary" actions by the companies and policymakers. Ilargi: I’d like to see Gross and Fuss (what a wonderful set of names!) declare how much each of them stands to lose if things don’t go their way in the Fannie and Freddie field. And also how much they stand to gain if they do. Two of the biggest U.S. bond investors said they would get involved in a capital raising by Fannie Mae and Freddie Mac as long as the Treasury department participates in the new deals. But William H. Gross, the chief investment officer of Pimco, one of the nation’s largest money management firms, and Daniel Fuss, vice chairman of Boston-based Loomis Sayles, disagree on what shape any deal with Treasury should take, according to separate interviews on Friday. Mr. Gross would be drawn to a straight preferred stock offering similar to securities sold by Fannie Mae and Freddie Mac in raising capital this year and last, while Mr. Fuss wants an offering of convertible debentures. “We would buy preferred stock subject to significant Treasury participation and an attractive yield,” Mr. Gross told Reuters by email. Mr. Fuss, who helps oversee more than $100 billion in fixed-income securities at Loomis, has another idea. Mr. Fuss told Reuters the troubled government-sponsored enterprises should raise $15 billion each in the form of 30-year convertible preferreds to build capital reserves. The convertibles, which have characteristics of both a bond and a stock, would include a 5 percent coupon and a pre-set conversion price of around $6, Fuss said, given that Fannie Mae shares are now trading at $5.44 and Freddie Mac at $3.37. “It is a long-term call on the common stock,” Mr. Fuss told the news service. “Without such a plan like this, shareholders might get zero. You want zero or ongoing companies?” said Mr. Fuss, who owns Fannie Mae and Freddie Mac agency debt and preferred securities. The new 30-year convertible preferreds would be non-callable for life by Fannie Mae and Freddie Mac, while holders can convert the preferreds into common stock after holding them for six years, Mr. Fuss added. “Common holders will face dilution but it would be down the road with this plan,” Mr. Fuss said. Last week, executives at Freddie Mac were reportedly gauging investor interest from private-equity firms and other investors about the possibility of buying new common or preferred shares in the company. But reports said many investors fear any money they invest now in Freddie Mac or Fannie Mae will be lost later if the Treasury bails out the companies through an equity purchase. The Treasury’s investment in new convertible preferreds would add confidence that the securities would hold their value, Mr. Fuss said. “These new convertibles look outstandingly cheap,” he added. But Mr. Gross said a convertible preferred or convertible bond offering has no interest to him. “The equity is virtually worthless and will continue to be,” Mr. Gross said. “If the Treasury buys preferred stock, though, I would assume that would validate that class of equity during any liquidation/reprivitization.” Fannie Mae so far has raised more than $14 billion in capital since November to offset writedowns on mortgages it owns or guarantees. Freddie Mac has raised $6 billion since November. Mr. Gross told Reuters last week that he doesn’t believe a bail out by Treasury is imminent. “The election season and the relatively recent passage of the (Treasury) authorization argue for delay as long as possible,” he said. That delay, however, will be predicated on the notion that Fannie Mae and Freddie Mac can continue to sell discount notes and term debt at “relatively stable spreads,” said Mr. Gross, who manages the $130 billion Pimco Total Return fund. Monday, Freddie Mac easily sold $2 billion of debt, reassuring investors that it and Fannie Mae, who sold $2 billion of debt last week, can fund operations without a government takeover..
Ilargi: A: How much does Freddie need to sell, and could it do it? Or did it just sell what could be sold? C: How high will interest rates have to be next time around? Freddie Mac, the troubled US mortgage financier, yesterday easily sold $2bn of short-term debt, helping to reassure stock markets that Freddie and rival Fannie Mae still have access to fund their operations without a government rescue. Shares in Freddie rose by more than 12 per cent and Fannie was 4 per cent higher in morning trade, halting last week's dramatic sell-off for the two companies even as broader stock markets were lower yesterday. Freddie's auction of $2bn in three and six-month bills drew stronger-than- usual investor demand as buyers were attracted by higher interest rates for the paper. Fannie and Freddie have paid sharply higher interest rates for their debt in recent weeks as investors seek compensation for the uncertainty shrouding the ultimate scale of losses at the two companies and the potential structure of any government rescue. The US Treasury was granted powers late last month to extend its credit lines to Fannie and Freddie and invest in their debt and equity. During the past 10 days, expectations had been mounting that Treasury Secretary Hank Paulson may have had to use them to rescue the two stumbling government-sponsored mortgage companies with taxpayer money. Freddie yesterday sold $1bn of three-month bills at 2.58 per cent, compared with a 2.475 per cent rate for similar paper sold last week. The mortgage financier also paid a higher 2.858 per cent rate to sell $1bn of six-month paper, compared with 2.78 per cent for a similar sale last week. The higher rates yesterday drew bids for between three and four times the amount of paper on offer, compared with about 2.5 times the amount on offer in last week's sales. Freddie and Fannie rely heavily both the short and long-term debt markets to refinance maturing issues that fund their combined $1,500bn in mortgage investments. Their ability to sell debt, and attract strong interest, under conditions of in-creased uncertainty gave stock markets greater confidence that the agencies would be able to continue enjoying access to debt funding, and thereby stave off a government intervention. Treasury officials were working on the issue of Fannie and Freddie throughout the weekend, after Fannie and Freddie both lost more than 40 per cent of their market value last week on speculation that a government rescue for the companies would leave shareholders with nothing. The uncertainty also spread to the companies' preferred shares. Federal regulators have raised the number of struggling U.S. banks they have effectively put on probation, forcing them to fix their problems to avoid potential failures, The Wall Street Journal said on Monday. The two main U.S. bank regulators—the Federal Reserve and the Office of the Comptroller of the Currency—have issued more memorandums of understanding this year than they did for all of 2007, the Journal said, citing data obtained from regulators under Freedom of Information Act requests. Banks don’t have to disclose the memorandums, which are an early-warning system about troubled banks but are not meant to imply a bank is at risk of failing, the Journal said. They are often a precursor to more severe, publicly disclosed enforcement actions if conditions do not improve. The secret agreements can force banks to take steps including raising capital, cutting back on risky loans and suspending dividend payments, the Journal said. The Federal Deposit Insurance Corp is scheduled to release its updated list of “problem” institutions on Tuesday, the Journal said. There were 90 banks on its list on March 31. Yet, since July 11 five banks have failed and many other banks are considered at risk by regulators, the Journal said. U.S. banks are struggling with their worst crisis since World War Two amid deteriorating real-estate and credit markets. Regulators would not disclose the names of banks with which they’ve entered into memorandums. As of June 17, the Fed had entered into 32 memorandums with state-chartered banks and bank holding companies. For all of last year, the Fed entered into 31 such agreements. The OCC, a division of the Treasury Department that supervises national banks, entered into nine memorandums with banks through August 15, compared with just six in all of 2007. The FDIC, which insures deposits at U.S. banks and thrifts and is the primary regulator of many smaller lenders, has entered into 118 memorandums as of August 15, compared with 175 for all of 2007. The Office of Thrift Supervision, which supervises federal savings and loans, refused to disclose data, the Journal said. More than a year into the credit crisis, the world's top central bankers admit they are still in the dark as to what its ultimate impact on the global economy will be. By the same token they are unsure to what extent weakening growth will help to ease high inflation. "There is enormous uncertainty about where we stand at the moment," Stanley Fischer, governor of the Bank of Israel, said at the close of the Federal Reserve's annual retreat in Jackson Hole, Wyoming. His comments came as US Treasury officials worked through the weekend on options for Fannie Mae and Freddie Mac, the troubled mortgage groups, amid expectations an announcement could come this week. Mr Fischer told central bankers from 43 nations "we are in the midst of the worst financial crisis since World War II". But it was still not clear how big an event it would turn out to be. So far, he said, "in real economy terms we are not looking at anything exceptional". But the crisis was entering a "second round" in which economic and financial weakness could feed on each other. Other current and former central bankers shared this view. Alan Blinder, a former Fed vice-chairman, said: "It is amazing a year later how much is still unresolved." Monetary policymakers appear torn between hope that the global economy is turning out to be resilient - in part thanks to policy interventions - and fear that the worst could lie ahead. They think the economy will muddle through and recover next year. But they cannot rule out the possibility that the financial crisis - in conjunction with the oil shock - could deliver a bad economic outcome. Policymakers also differ on the global distribution of the growth risk. US officials see the slowdown in Europe as vindicating their view that the squeeze will hit all industrialised economies. However, eurozone officials attribute its slowdown to oil and a high exchange rate, rather than a domestic credit squeeze. All central bankers privately admit they want some economic slack to put downward pressure on inflation. The question is how much they need and how much they are going to get. All remain concerned about price increases in spite of the recent moderation in oil. They thought Ben Bernanke, Fed chairman, was bold to highlight this in a speech on Friday. Over the past year, the Fed has cut rates by 325 basis points, while the Bank of England has cut by only 75 basis points and the European Central Bank has raised by 25 basis points. Much of the difference is because the US is at the centre of the credit and housing shock - and is less vulnerable to a wage-price spiral. But most central bankers believe that even taking this into account, there are strategic differences in how the big central banks have responded. Some feel Fed policy risks fuelling inflation. Others, however, worry the ECB could stay too tight too long. Yukata Yamaguchi, a former deputy governor of the Bank of Japan, warned that policy mistakes are easy to make in periods of "exceptional uncertainty". China has resorted to stealth intervention in the currency markets to amass US dollars, using indirect means to hold down the yuan and ease the pain for its struggling exporters as the global slowdown engulfs the economy. A study by HSBC's currency team in Asia has concluded that China's central bank is in effect forcing commercial banks to build up large dollar reserves, using them as arms-length proxies in a renewed campaign of exchange rate intervention. Beijing has raised the reserve requirement for banks five times since March, quickening the pace with two half-point rises in late June. This is having major spill-over effects into the currency markets because banks in China have been required over the last year to hold extra reserves in dollars rather than yuan. The latest moves have lifted the mandatory deposit from 15pc to 17.5pc of total lending since March. "China has used the pretext of reserve requirement hikes to help slow yuan appreciation. We estimate that the PBOC [central bank] intervened by about $49.6bn in June," said Daniel Hui, the bank's Asia strategist. Beijing has also slashed the amount of foreign debt banks operating in China can hold. The effect is to oblige the banks to become net buyers of dollars, halting the flow of foreign "hot money". Given the sheer scale of China's foreign reserves - now $1,800bn (£970bn) - any shift in its exchange policy now ripples around the globe. The covert buying may help to explain at least part of the explosive dollar rebound over recent weeks. There is little doubt that the key driver behind the wild currency ructions this summer has been the blizzard of dire data from Britain, Europe, Japan and Australasia. The mounting danger of a full-fledged recession across the club of rich OECD nations appears to have caught the markets off guard. The closely watched Dollar Index reached an all-time low in March. It crept up gradually in the early summer before smashing through resistance in July. The world's currency system is swivelling on its axis. Central banks in Asia and Europe have stopped raising rates, and some have begun to cut aggressively. The Federal Reserve is no longer nakedly exposed. Indeed, investors are already starting to look ahead to the next round of Fed tightening. The 18pc slide in oil prices from a peak of $147 a barrel in July has added juice to the dollar rally. Russia and the Middle East petro-powers tend to recycle a high proportion of their vast earnings from oil into the eurozone, either by purchasing European bonds or expensive imports. A Bundesbank study found 40 cents of every dollar spent by eurozone countries on oil imports comes back again one way or another. The figure for the US is just 10 cents. This trade bias has given oil a new character as a sort of anti-dollar driving the currency markets. Even so, the China effect is a key ingredient in the dollar comeback. Beijing's Politburo is clearly disturbed by the sudden downward turn in the economy as export markets freeze, and surging wage inflation in the country's manufacturing hubs eats away at profit margins. "They are now more worried about growth than overheating, and you are seeing that play out in the currency markets. There has been a remarkable change of view," said Simon Derrick, exchange rate chief at the Bank of New York Mellon. China's PMI purchasing managers index fell below 50 for the first time in July, signalling an outright contraction in manufacturing output. Hong Kong's economy contracted 1.4pc in the second quarter. The Politburo has rushed through special rebates for textile producers now caught in a ferocious downturn. Much of the clothing, footwear and furniture industry has been hit, leading to mass plant closures in the Pearl River Delta. "During the first half of this year, about 67,000 small and medium-sized companies went bankrupt throughout China, leaving more than 20m people out of work," said the National Development and Reform Commission. "Bankruptcies of textile and spinning companies have numbered more than 10,000. Two thirds are on the brink of bankruptcy." Last week's rebound on the Shanghai stock market stalled on fading hopes of a fiscal stimulus package. "It is unrealistic to expect the government to rescue the market," said Li Ka-shing, chairman of Hutchison. "Speculators should be very cautious now. The worst is not over in the global credit crisis." Lehman Brothers warns of a risk that a housing slump and the 55pc equity crash since October could combine with a global downturn to set off a "vicious cycle". House prices have already fallen 18pc in Guangzhou and 9pc in Beijing. Prices are now falling in cities that make up over half China's population. China may let investors sell bonds that can be swapped for shares to deter equity sales and support the nation's stock market, the world's worst performer this year. The China Securities Regulatory Commission is studying exchangeable bonds as part of a package of measures to restrict sales of shares in state-owned companies, said a Beijing-based official of the regulator who declined to be identified before a proposal is made public. The plan would enable state shareholders to raise funds without selling stocks on the market, limiting supply as trading restrictions end on more than $1 trillion of government holdings. A cut in trading taxes and curbs on initial share sales failed to halt a 56 percent slump in the benchmark index this year. "This measure will help ease the pressure placed on the market by state-owned shares," said Victor Wang, a Hong Kong- based analyst at UBS AG. "Investors' sentiment is quite low and the government has been trying to bolster market confidence by limiting massive share sales." As much as 8.7 trillion yuan ($1.3 trillion) of government holdings become tradable through 2010, according to local data provider Wind, an overhang that's weighing on investors just as inflation and a slowing economy threaten to undermine earnings growth. China's benchmark CSI 300 Index soared 7.9 percent on Aug. 20, its biggest gain since April, on speculation the government would announce plans to support a market that has lost $2 trillion in value this year. The index gained 162 percent last year, the world's best performer. It declined 2.9 percent to 2,331.53 at the 3 p.m. close today. The commission doesn't have a timetable for the plan, the official said. The rules haven't been completed and it's unclear if the bonds can be traded before they are turned into common stock, the person said. The measures being considered will include more transparent information disclosure when holders of state-owned companies' shares place sales through block trades, and working with the state-asset supervision agency to monitor transfer of those shares, according to the official. The securities watchdog said on Aug. 15 it may use brokerages as intermediaries to sell state-owned companies' shares instead of placing them directly on the secondary market, to ease pressure on share prices. In April, the Beijing-based commission brought in rules to limit the amount of state-owned stock that can enter the market. Shareholders selling more than 1 percent of a company's shares within a month must do so through block trades, which require a buyer to be lined up beforehand, and don't go through an exchange. The finance ministry cut the tax on share trading to 0.1 percent, from 0.3 percent, in the same month. The CSRC was also delaying the issuance of written approval documents, the final regulatory stage, to companies preparing IPOs to arrest the stock market's decline, two people familiar with the matter said earlier this month. The CSI 300 has tumbled this year on concern that central bank's efforts to tame inflation, which reached a 12-year high in February, and weakening economic growth will hurt earnings. China's economy grew 10.1 percent in the three months through June, slowing for a fourth quarter. The index rose more than sevenfold between July 2005 and October, driven partly by the success of the government's plan for non-tradable shares. The ownership shakeup ended a four-year bear market and paved the way for share sales by PetroChina Co., Industrial & Commercial Bank of China and China Construction Bank Corp. Companies raised $63 billion selling stock in China in 2007, more than the previous six years combined. Pressure is mounting on Gordon Brown to find help for hard-pressed families as the new Deputy Governor of the Bank of England warned that the financial situation was at least as bad as that of the 1970s. As the Prime Minister returns to his desk today to work on an economic plan that will form the centrepiece of his attempt at an autumn political fightback, Charles Bean said that the slowdown may "drag on for some considerable time" and that social problems could be caused by the squeeze on household incomes. Mr Bean, speaking at a central bankers' conference in Wyoming, said that the financial crisis was a "transitory period". But he warned that every time the markets appeared to be recovering, "another grenade" exploded. He said that there was a mood of "considerable caution" about next year. "We've got our fingers crossed that things will improve. But there is the recognition that there is still a long way to go yet," he said. "It looks like it will drag on for some considerable time. It's fair to say that if you look at the shocks impinging on us this is at least as challenging a time as back in the 1970s." Sir Peter Burt, a former governor and chief executive of the Bank of Scotland, also warned yesterday that the credit crunch and the rise in fuel costs were worse than the crisis of the 1970s and urged the Bank of England to make it clear it would guarantee deposits to make it clear that it would prevent a bank failure. "I hope the Bank of England are doing more than cross their collective fingers," he told the BBC. "Instead of suggesting and hinting that no bank would be allowed to fail they should do what they did in 1974-75, come out categorically and say no bank, no creditors of any British bank, will lose money. Full stop." It also emerged yesterday that up to a dozen junior members of the Government have joined other Labour MPs to press ministers to impose a windfall tax on energy companies' profits to help people struggling with rising fuel bills. The director general of the CBI, Richard Lambert, is also seeking action to help families hit by rising prices and the economic downturn, although he insisted that it was not right to impose new taxes on business. Mr Lambert said: "Some vulnerable citizens are going to need help – for example, when it comes to paying their fuel bills this winter." But he warned: "The worst way to approach this would be though an arbitrary and unfair tax raid that would jeopardise badly needed investment in our energy infrastructure in the years ahead." Vince Cable, the Liberal Democrat Treasury spokesman, said that the economy was in "free fall". He added: "Ministers need to focus their efforts on protecting those at greatest risk from the worsening economic situation. That means greater support for people living under the threat of having their homes repossessed and helping the large number of vulnerable people who will be hit with huge energy bills this winter." Of the dozen parliamentary private secretaries backing calls for a windfall tax, five – Derek Wyatt, Mark Lazarowicz, Stephen Pound, John Robertson and Mary Creagh – have already signed a petition organised by the left-leaning campaign group Compass calling for the change. At least another six are said to be privately supportive of the campaign, which says: "It's absolutely right that the corporations who are benefiting from that original investment and the later privatisation pay their fair share to society." Mr Pound, PPS to the Welfare Reform minister, Stephen Timms, said: "The majority of my constituents would be very much in favour of this." Amid the calls for help, a survey published by the price comparison website uSwitch warned that disposable incomes had fallen in cash terms for the first time since 1997, dropping by 15 per cent since last year to an average of £14,520. Fresh gloom descended on the housing market today as it emerged that fewer than 22,500 mortgages were approved last month, a 65 per cent decline on last year and only fractionally above record lows for June. According to figures released by the British Bankers' Association, just 22,448 mortgage loans were approved in July. This is only slightly ahead of June's low of 22,369 and compares with an average monthly rate over the previous six months of 34,104. It is thought that the annual, near two-thirds slide in approvals is among the biggest ever recorded by the BBA, which acts as the mouthpiece for the bank lending industry. The figures, which also show an 11.9 per cent slide in the average loan value to £138,000, suggest that there is little relief in sight for embattled British homeowners. House prices have fallen by as much as 10 per cent in the past 12 months, according to some estimates, as high street banks have tightened their loan criteria, making it harder for homebuyers to borrow. According to the Halifax, among the UK's biggest mortgage lenders, house prices fell by 1.7 per cent in July and have fallen 8.8 per cent over the past 12 months. Total net mortgage lending, seasonally adjusted, remained flat at £4.3 billion in July, according to the BBA, below the six-month average of £4.8 billion. David Brooks, the BBA's statistics director, said: "The monthly numbers of approvals for house purchase ... levelled off in July. It would, however, be premature to think that the housing market will now start to recover, because overall approval activity continues to be very low." Mr Brooks added that the slide in approvals also showed that consumers were acting prudently in the light of pressures on household budgets. The BBA also published figures today that showed that spending on credit cards had fallen by £200 million during July to £7.1 billion for the month as a whole. The most recent monthly spending total compares with an average of £7.4 billion over the previous six months. It came as uSwitch.com, the price comparison website, claimed that gross mortgage lending has fallen by £10 billion over the past year - at an average quarterly rate of £2.5 billion. Unsecured lending, including on credit cards, has fallen by £1.1 billion over the same period, according to uSwitch, which said the drop corresponded to more than 157,000 individual loans. USwitch published research today which it claimed showed that consumers who were being denied convential bank loans were running up their credit card bills instead. It said credit card debt, which stands at £54.9 billion, would surge to £158 billion if card-holders borrowed up to their limit. Simeon Linstead, head of personal finance at uSwitch, said: "In just 12 months, this economic landslide has sent the consumer lending market into disarray. "For those with perfect credit records, it's unlikely this will be an issue, but for others it could be problematic." The London stock market suffered a bank holiday hangover this morning, with shares tumbling across the board and sterling hitting a two-year low against the dollar amid fears that the credit crunch has a long way to run. The FTSE 100 index shed 136.3 points in early trading to 5,369.3, a drop of more than 2.5%, with almost every company losing ground after the long weekend. Energy and commodity firms and financial institutions led the fallers. The FTSE 250 index of smaller companies, which many analysts say is a better barometer of the state of the UK economy, also shed 1.75%. David Buik of BGC Partners said traders had been in denial over the true state of the turbulence gripping the world economy. "This crisis has another six to nine months to run," Buik predicted, blaming the world's banks for failing to come clean over their credit crunch writedowns. The sell-off was triggered by fresh losses in America overnight, where the Dow Jones industrial average fell 241 points to 11,386. The world's largest insurer, AIG, fell by 6% on speculation that it may announce losses of $2.4bn (£1.91bn) in mortgage-related writedowns. "Many banks still have skeletons in the closet," said Buik, who believes the credibility of the whole financial sector has suffered from the drip-drip-drip approach to credit crunch losses. "They've been announcing losses of £9bn and then coming back and saying 'Sorry guv, I meant £12bn'. You can't keep doing that," he said. The credit crunch was sparked by the US sub-prime mortgage industry, which threatens to claim Fannie Mae and Freddie Mac, companies that underpin the American mortgage industry. The US government may have to step in to keep the pair afloat if they cannot finance themselves. Yesterday, JP Morgan admitted that the shares it owns in the two companies are worth only half as much as previously thought — $600bn not $1.2bn. Other banks, which make up most of Fannie and Freddie's shareholders, may have to follow suit. On a brighter note, Freddie sold off $2bn of short-term debt yesterday. The London markets were also hit by the gloomy prediction yesterday from Bank of England deputy governor Charles Bean that millions of households will suffer from the economic slowdown. World markets may take another hit today when the latest US consumer confidence data is published. Earlier today German consumer confidence hit a five-year low. This helped to boost the dollar against a range of currencies, with sterling dropping to $1.8384, its lowest point since the summer of 2006. Asian stocks fell the most in a week, led by financial companies, as speculation of increased credit- market losses weighed on regional growth and earnings. Mitsubishi UFJ Financial Group Inc. declined 1.3 percent in Tokyo after Credit Suisse Group said American International Group Inc. may lose $2.41 billion this quarter on mortgage-related writedowns. Suncorp-Metway Ltd. dropped 3.4 percent as Australia's third-largest general insurer said bad debts may rise. Sumitomo Realty & Development Co., Japan's No. 3 developer, fell 1.1 percent after rival Sebon Corp. filed for bankruptcy. "There's been an impairment of capital in the global banking system," said Sean Fenton, who manages the equivalent of $563 million, including banking shares, at Tribeca Investment Partners in Sydney. "It's the continuance of concerns not just over mortgage losses, but the process of credit destruction that has been set off all around the world." The MSCI Asia Pacific Index lost 1.1 percent to 122.30 as of 7:13 p.m. in Tokyo, its largest drop in a week and almost erasing yesterday's 1.7 percent advance. Financial companies accounted for more than a quarter of the measure's retreat today. The Asian index has declined 22 percent this year, led by banks, securities firms and developers, as the world's largest financial companies posted writedowns and credit losses of more than $500 billion and inflation soared. Japan's Nikkei 225 Stock Average slipped 0.8 percent to 12,778.71. China's CSI 300 Index dropped 2.9 percent after the daily trading value fell yesterday to the lowest since November 2006. Pakistan's Karachi Stock Exchange 100 Index posted the region's largest loss, tumbling 3.9 percent. Indexes retreated in all other Asian markets apart from Vietnam and India. Mirvac Group, an Australian property trust, declined after posting a 69 percent decline in full-year profit. IHI Corp., the nation's No. 3 maker of heavy machinery, fell after saying it won't pay a dividend in the first half because of a loss. U.S. stocks dropped yesterday, sending the Standard & Poor's 500 Index to its largest loss in a month. AIG tumbled to a 13- year low, while other financial companies dropped after Columbian Bank & Trust Co. became the ninth U.S. bank to collapse this year. S&P 500 index futures added 0.2 percent today. "With more bad news emerging on U.S. financial shares, it's natural to see the market here take a hit as well," Mamoru Shimode, Tokyo-based chief equity strategist at Deutsche Bank AG, said in an interview with Bloomberg Television. Mitsubishi UFJ, Japan's biggest bank by market value, retreated 11 yen to 820. Macquarie Group Ltd., Australia's No. 1 securities firm, fell 3.2 percent to A$46.05. A gauge of financial companies on MSCI's Asian index has dropped 27 percent this year, the worst performance among the broader measure's 10 industry groups. AIG tumbled in New York trading after Credit Suisse analyst Thomas Gallagher predicted AIG will lose 86 cents a share in the third quarter, compared with an earlier forecast of a 13-cent profit. "Recent deterioration" in debt holdings may cause losses in the firm's credit-default swaps, Gallagher wrote yesterday in a research note. Temasek Holdings Pte, a $130 billion Singapore sovereign wealth fund, expects the fallout of the credit crisis to "continue to dampen the global economy over the next 24 months" and limit investment opportunities, Chairman S. Dhanabalan said. Suncorp-Metway slumped 44 cents to A$12.36 after saying net income tumbled 68 percent in the six months ended June 30 as storms increased and falling financial markets cut investment income. Chief Executive Officer John Mulcahy said bad debts may increase as the economy loses momentum. Fukuoka Financial Group Inc., Japan's second-largest regional bank by assets, fell 4 percent to 405 yen after HSBC Holdings Plc downgraded the stock to "underweight" from "neutral," citing rising property defaults nationwide. The brokerage also lowered its rating on Bank of Yokohama Ltd., the nation's largest regional lender, whose shares slipped 2.6 percent to 612 yen. "Real estate-related bankruptcies have spiked," Kentaro Kogi, a Tokyo-based analyst at HSBC, said in a report today. "Real estate firm bankruptcies remain our biggest concern for regional bank credit costs." Sebon, a Tokyo-based real-estate developer, filed for bankruptcy protection yesterday with 62 billion yen ($568 million) in liabilities. Construction and real estate companies accounted for almost a third of all bankruptcies in Japan in July as banks cut lending and the country's economy shrank. Russia's RTS Index fell to the lowest level since 2006, the ruble extended its drop and the cost of protecting the country's bonds rose as the government recognized the independence of Georgia's breakaway regions. The RTS index of 48 companies posted the biggest decline among 89 global equity measures tracked by Bloomberg, while Russia's currency slid to the lowest level in almost seven months against the dollar. Credit-default swaps on Russian debt climbed 7 basis points, according to CMA Datavision prices in London, as President Dmitry Medvedev risked a deepening rift with the West by recognizing South Ossetia and Abkhazia. Investors have pushed the RTS to this quarter's steepest retreat among the world's stock markets as Russia invaded Georgia and tumbling oil prices sent energy producers lower. Medvedev's statement followed a unanimous call by Russia's parliament to back the enclaves' aspirations for statehood in the aftermath of a five-day war that began on Aug. 8. "The sentiment here remains pretty bad because of the events in Georgia," said Jean-Louis Tauvy, who manages $300 million at Atria Advisors Ltd. in Moscow. The dollar-denominated RTS Index fell 5.3 percent to 1,560.14 at 4:19 p.m. in Moscow, extending its third-quarter drop to 32 percent. The ruble-denominated Micex Index slumped 3.3 percent to 1,276.47, the lowest level since September 2006. VTB Group, Russian's second-biggest bank, plunged 6.3 percent to 6.42 kopeks, the lowest level since its initial public offering last year. "I signed decrees on the recognition by the Russian Federation of the independence of South Ossetia and Abkhazia," Medvedev said on television from Sochi today. "Russia calls on other states to follow its example." OAO Gazprom, the country's biggest publicly traded company, sank for a third day, losing 2.7 percent to 226.50 rubles. Crude oil for October delivery fell as much as $2.75, or 2.4 percent, to $112.36 a barrel on the New York Mercantile Exchange. Russia's ruble declined as much as 1.3 percent to 24.7676 to the dollar, the lowest since Feb. 7. "This adds to the uncertainty of doing business in Russia and so people are reducing their positions," said Lars Rasmussen, an emerging-markets analyst at Danske Bank A/S in Copenhagen. "It now seems like this conflict could go on for a prolonged period." Credit-default swaps on Russian government debt rose 7 basis points from Aug. 22 to 135, according to CMA Datavision prices at 12 p.m. in London. Contracts on Gazprom rose 11 basis points to 267, CMA prices show. German business and consumer confidence fell more than economists forecast, heightening concern that Europe's largest economy may be slipping into a recession. The Munich-based Ifo institute's business climate index, based on a survey of 7,000 executives, dropped to a three-year low of 94.8 from 97.5 in July. Consumer sentiment slumped to the lowest level in five years, according to Nuremberg-based market research company GfK AG. The euro and bond yields fell. Germany's economy contracted in the second quarter and may fail to grow in the third. While oil prices have receded from a record $147.27 a barrel, they're still up 60 percent over the past year, crimping companies' spending power just as the euro's appreciation and the U.S. housing slump weigh on exports. "With today's data, the risk of a recession has increased," said Joerg Kraemer, chief economist at Commerzbank AG in Frankfurt. "Germany is no longer in a position to resist the downward spiral. I can't even see the end of it." Ifo's gauge of business expectations dropped to 87, the lowest since February 1993, when Germany was experiencing the worst recession of the past two decades. A measure of current conditions eased to 103.2 from 105.7. The economy contracted 0.5 percent in the three months through June as construction slumped and companies and households reduced spending, the Federal Statistics Office confirmed today. Exports also fell. The euro dropped more than a cent after the Ifo report to $1.4597 and yields on 10-year German bonds fell 5 basis points. "A serious German downturn would not bode well for the euro zone as a whole, to put it mildly," said Holger Schmieding, chief European economist at Bank of America Corp. in London. The chances of the European Central Bank cutting interest rates are growing, Ifo economist Gernot Nerb said. The ECB last month raised its key rate by 25 basis points to 4.25 percent to fight inflation. The rate increase "was certainly not helpful," Nerb said in an interview with Bloomberg Television. "In the current environment, it would be better if they" lowered borrowing costs. "It's difficult to say whether the worst is behind us." Investors raised bets that the ECB's next move will be a rate reduction, Eonia forward contracts show. The yield on the March contract fell to 4.13 percent today from 4.61 percent on July 21. While the German government has maintained its forecast for growth of 1.7 percent this year after 2.5 percent in 2007, the Berlin-based BDB banking association said on Aug. 20 the economy may barely expand in the second half of the year. Arcandor AG, Germany's largest department-store operator, on Aug. 13 reported a loss for the quarter through June and reduced its 2009 earnings forecast. Daimler AG, the world's second-largest luxury carmaker, said Aug. 6 it plans to cut production by 45,000 vehicles by the end of the year. In the economy of the 15 euro nations, manufacturing and service industries contracted for a third straight month in August and confidence in the economic outlook last month dropped the most since the Sept. 11 terrorist attacks in 2001. "I see a gradual weakening of the German economy but not a collapse," said Peter Loescher, chief executive officer of Siemens AG, Europe's largest engineering company. The price of crude has dropped 9 percent over the past month to around $114 a barrel and the euro has retreated from an all- time high of $1.6038 on July 15. Some companies are also benefiting from demand in faster-growing economies in Asia and eastern Europe. Hochtief AG, Germany's largest builder, on Aug. 14 raised its full-year earnings forecasts on increasing demand for construction and mining work. SAP AG, the world's largest maker of business- management software, last month raised its full-year earnings forecast on increasing orders. Still, "the airbag effect of lower oil prices and a weaker exchange rate hasn't kicked in," said Andreas Rees, chief German economist at UniCredit Markets & Investment Banking in Munich. "We see a recession risk of 70 percent this year." German corporate and consumer confidence today sank to new lows, hastening fears that Europe's biggest economy is sliding into a deep recession. Falling fuel prices, the drop in the euro exchange rate against the dollar and even the prospect of lower interest rates failed to inject confidence about the future. The Ifo Institute, based in Munich, reported that its business climate index had this month fallen to its lowest level since February 2006, worse than expected, while expectations for the future were at their lowest level since February 1993. Separately, the GfK consumer climate forecast index slumped to a five-year low despite significantly lower crude oil prices. "Consumers are not interpreting the marked decrease in crude oil prices as an all-clear signal when it comes to purchasing power," GfK said. The German economy contracted by 0.5% between April and June after growing by 1.3% in the first quarter. This was initially blamed on special factors, but third-quarter output could also shrink, putting the economy in recession. Earlier this month the economics ministry, which expects 1.7% growth this year, confirmed that investment and consumer spending had nosedived, with the economy held up by exports to emerging markets. RBS economists said their forecast of a rebound in business expectations had been confounded. "The last time the expectations index [of Ifo] was this low, the German economy fell into a sharp recession," they said, pointing to an increased risk of a deeper and more protracted downturn. They said the odds that the next move by the European Central Bank would be down had increased, a sentiment echoed by other observers. The ECB, which raised rates to 4.25% in July to counter eurozone inflation at 4%, double its target, meets next week. Analysts expect the ECB to keep rates on hold. But, as further evidence emerges of the downturn in France, Italy and Spain as well as Germany, it may gradually ease its monetary stance, sending borrowing costs down to around 3% next year. Ilargi: Jefferson County functions as a test-case and dress rehearsal for thousands of other communities. It hasn't been tried before on this scale. It'll be the blueprint. The president of the Jefferson County Commission has softened her opposition to bankruptcy and is instructing lawyers to begin research on the impact a bankruptcy filing would have on the county. President Bettye Fine Collins' move could substantially alter the course of negotiations as advisers work with Wall Street creditors on how to handle Jefferson County's $3.2 billion sewer debt and soaring interest rates the county is unable to pay. "A lot of it depends on Wall Street, as to whether we have to file bankruptcy or not," Collins said in an interview with The Birmingham News. "My sympathies are not with Wall Street. I think they realize now they are in a situation where the clock is ticking." Collins had been part of a 3-2 majority on the commission that was steadfastly opposed to filing the largest municipal bankruptcy on record. Since Collins and Commissioners Shelia Smoot and George Bowman voted earlier this month to hold a nonbinding referendum on the county's debt in the Nov. 4 election, there has been an outpouring of community sentiment against the county pursuing plans to repay banks and creditors in full. "I've gotten hundreds of opinions supporting bankruptcy," Collins said. "Since we've put that on a referendum, it has accelerated. I think we're getting more of a representative view. Very few people are saying they don't want bankruptcy." The idea of bankruptcy emerged as a viable option in July, when Alabama pension chief David Bronner said the Retirement Systems of Alabama would buy Jefferson County's sewer system for as much as $1.4 billion if commissioners agreed to file for court protection under Chapter 9 of the U.S. Bankruptcy Code. Under Bronner's plan, that money then would go to creditors, who would be left to try to recover the rest from firms that insured the county's sewer bonds. While Commissioners Jim Carns and Bobby Humphryes supported the Bronner plan, Collins, Smoot and Bowman rejected it. The issue has bitterly divided the five-member board that governs Alabama's most populous county. Meantime, the Jefferson County Mayors Association last week unanimously approved a resolution urging the county to file bankruptcy if a deal with creditors cannot be worked out by Sept. 1. Investment banks that hold much of the sewer debt convinced the county in 2002 and 2003 to refinance what had been mostly fixed-rate bonds into variable- and adjustable-rate warrants that are now causing the county's financial crisis. In interviews with The News, Collins said she was still not convinced the county would have to file bankruptcy, but creditors "are getting closer to the day when that final option will have to be examined and a decision made." She instructed the county's legal department to look at what form a bankruptcy would take, if one is filed, she said. Collins is asking county attorneys to research several issues if a bankruptcy is filed, including: What would happen to the consent decree that the county entered into in 1996, agreeing to fix the sewer system to settle a lawsuit over pollution being dumped into streams. That effort, initially estimated to cost $1 billion, mushroomed into the $3.2 billion project to rebuild and expand the system. Would the U.S. Environmental Protection Agency clear the county of sewer obligations if the system were sold to the RSA? Who would be responsible for future sewer projects if required under the federal Clean Water Act? Collins' directive on considering bankruptcy comes at a key time: Jefferson County's latest and perhaps final forbearance agreement with creditors will expire Friday, because a creditor-endorsed plan to raise taxes to help repay the debt is now likely dead. If another extension is not signed, the county will face sharply increased interest, penalties and principal payments on its sewer debt. According to a June analysis by the county's former financial adviser, Porter White & Co., those costs could pile up at a rate of $50,000 an hour. Although she has directed county lawyers to start researching bankruptcy, Collins said she still has concerns and considers bankruptcy only to be a last resort. "Our borrowing money will be severely impaired," she said. "I can imagine a situation where we can't go out to the bond market for several years for capital needs." Bowman said the threat of bankruptcy is a "strategy to get more concessions, but I don't know if that is a winning strategy. My position on that is very clear. I am not in favor of bankruptcy in any way, shape or form. We can solve this problem short of that." Gov. Bob Riley met last week with Collins, Carns and Smoot to discuss the county's crisis, and intends to meet with Humphryes and Bowman. The divided commission must unify and deal with the crisis, the governor said. Smoot, who met with Riley for 90 minutes Friday in Montgomery, declined to say whether her opinion on bankruptcy had changed. "I think we need to just keep our options open and just bring everybody back to the table," she said. Humphryes, who already supports bankruptcy, said Friday he felt it was time to start initiating the process of filing under Chapter 9. Carns, who also supports bankruptcy, said he expects any plan the commission approves would require Wall Street to "take a hit" and not require additional taxes for residents. Whatever happens, Collins said she wants the commission to find a plan it can support unanimously and avoid the bitter debates that have plagued the panel since interest rates sparked the crisis in February. One of the next major decisions confronting the commission could be whether to authorize the county attorney to file for bankruptcy. "We have never said we wouldn't be serious about bankruptcy, if we had to." Collins said. "It's just a last-resort effort. If that happens there should be a united commission about that. How that's going to play out I don't know." The Federal Deposit Insurance Corp. is one of those agencies with a low profile but essential role similar to plumbing or electricity — you don't notice it until the power's out or the basement's flooding. These days, the FDIC's folks are busier with the financial equivalent of fixing burst water mains and dead power lines. Seventy-five years after it was launched during the Great Depression, the bank regulator and insurer is facing its biggest challenge in decades. Many banks in Georgia and across the nation have been battered by the slumping economy and troubled loans to home builders, developers and homeowners. Hundreds could fail, some industry experts predict. That could force the agency to make good on its promise to insure most customers' checking and savings deposits up to $100,000 and some retirement accounts up to $250,000, putting pressure on its insurance fund. Is the agency, whose combined insurance funds were technically pushed into insolvency during the savings and loan debacle two decades ago, ready for another banking crisis? And how bad could it get? Despite the frequent gloom on both Wall Street and Main Street, industry players seem confident in the overall resiliency of the banking industry and the FDIC's ability to shelter customers from bank failures. The FDIC, which had shrunk to 4,600 employees from 23,000 at the height of the savings and loan meltdown, has been gearing up for another wave of bank failures. It's hiring 70 new employees and bringing back 70 retirees to beef up its teams that swoop in, usually over a weekend, to take over and reopen banks under new management. The FDIC's Atlanta regional office, which covers seven states from West Virginia to Florida, also recently boosted its bank examiner and professional staff by about 10 percent, to about 300. The agency is also expected to soon raise the insurance premiums it charges banks and thrifts to begin rebuilding its reserves. The FDIC won't discuss its projections, but it has been increasing its loss provisions for expected bank failures and adding institutions to its growing "problem" bank list. The list totaled 90 institutions with $26.3 billion in assets at the end of March. The confidential list is expected to be longer when the FDIC issues an update Tuesday. "We don't predict numbers of bank failures," FDIC spokesman David Barr said. "We do realize that there will be more failures, but it's something that we can manage." Even though most of the headline-grabbing bank and real estate problems center on Florida and California, Georgia is likely to emerge as a hot spot, as well. The state's banks, which included 109 community banks that were launched since 2000, built up the nation's heaviest concentration of loans to home builders and real estate developers. Many of those businesses have since gone belly-up, saddling banks with growing piles of bad debt and foreclosed properties. Nine of the state's banks recently landed on a top-25 list compiled by SNL Financial based on the so-called "Texas ratio," which attempts to gauge how likely the institutions will run into financial trouble. FDIC officials said they expect the Deposit Insurance Fund, which had $52.8 billion at the end of March, to remain sound. "The losses would have to be pretty catastrophic" to create a deficit, said Arthur Murton, the FDIC's director of insurance and research. That's because, Murton said, under a federal reform law passed after the S&L crisis, the agency was given more flexibility to raise the deposit insurance rates it charges banks whenever needed. "We have a pretty significant fund, and we have the ability to replenish it," he said. Certainly the FDIC's and the banking industry's challenges so far haven't come close to the challenges of the 1930s and 1980s. Some 9,000 banks failed in the four years before Congress created the FDIC in 1933. Thousands of institutions also failed during the S&L crisis. Year to date, eight institutions have failed. Georgia has so far gotten off rather lightly, with no bank failures this year and relatively few during those earlier crises. Eight Georgia banks failed in the late 1930s, and 21 collapsed from 1988 to 1992. The largest so far was last year's shutdown of NetBank in Alpharetta, with $1.5 billion in deposits. But both the state and national tallies will grow, industry analysts predict. They expect possibly hundreds of bank failures nationally over the next few years as more borrowers ranging from homeowners to businesses default on loans. How many will depend on whether the economy enters a recession. "For a lot of banks, the die has already been cast," said Jeff K. Davis with FTN Midwest Securities. At the low end, he estimates that roughly 100 banks will fail over the next 18 months if falling crude oil prices and recent gains on Wall Street point to a possible turnaround in the economy. That number could swell to 600 failures if the economy falls into a serious recession, although most will be small community banks, he added. The FDIC will have to absorb "some expensive failures," but nothing like past waves of bank failures because banks are generally much larger and better diversified, said Bert Ely, a longtime bank industry consultant who has his own firm in Alexandria, Va. "The banking industry goes into this mess much stronger than it was" in those earlier eras, he said. Some industry watchers say bank failures could wipe out much of the FDIC's insurance fund, forcing the agency to collect significantly higher premiums from financial institutions in the future. The eight failures this year are expected to cost $5 billion to $9 billion, potentially wiping out up to a sixth of the FDIC's insurance fund. Because of the likely drain on the fund, the FDIC is expected to increase deposit insurance rates as early as next month. Otherwise, the losses will push the fund below a statutory minimum of 1.15 percent of insured deposits. The fund equaled 1.19 percent of insured deposits at the end of March. "As the FDIC incurs losses, those losses will be passed back to the banking industry," Ely said. "The real party at risk here is the banks." But ultimately, the FDIC can turn to Uncle Sam for help. That's what happened during the S&L crisis, when billions in losses wiped out an insurance fund that covered savings and loan deposits. Congress stepped in and turned responsibility over to the FDIC in 1989, giving the agency extra time to rebuild its insurance reserves. Still, that fund dropped to a deficit of $7 billion in 1991 before it began to recover. The FDIC doesn't expect a replay of those events, despite the heavy losses the agency expects from this year's bank failures. The FDIC's Murton said the initial batch of shutdowns was probably not a good indicator of future trends. The expected losses were skewed unusually high by last month's failure of IndyMac Bancorp, he said. California-based IndyMac, with $32 billion in assets, was the nation's third-largest U.S. bank failure. It is expected to cost the fund $4 billion to $8 billion. "We had one of the largest and certainly what we think will be one of the most expensive failures at the beginning of the cycle," Murton said. "We don't expect to see repeats of that." In the event that he's wrong, he said the FDIC can draw on a $30 billion line of credit with the federal Treasury to continue covering future bank failures. Beyond that, said Barr, the FDIC spokesman, the agency is backed by the "full faith and credit" of the United States. "It's on the sticker" displayed by federally insured banks, he said. Gerard Cassidy, a veteran banking analyst with RBC Capital Markets, expects the FDIC to remain sound, even though he projects up to 300 banks will have to close within three years. He expects the FDIC to boost its rates up to 30 percent next month to shore up its insurance fund. "Although it's going to be challenging, it's not going to be all that bad," said Cassidy, who is credited with devising the so-called "Texas ratio" in the early 1990s to predict which banks or thrifts might fail. "If anyone has a deposit of less than $100,000, they can sleep as soundly as always," he said. Still, the FDIC's and other bank regulators' performance is getting mixed reviews. Critics say the agencies were too slow and did too little to steer banks away from risky mortgage loans and heavy concentrations in construction and home-builder loans, which account for much of the industry's expected losses. The FDIC also was criticized for its handling of last month's shutdown of IndyMac. Many people waited hours in long lines to withdraw money or check on accounts. On the other hand, the agency caused barely a ripple when it shut down several smaller institutions such as Bradenton, Fla.-based First Priority Bank, whose deposits were taken over earlier this month by Atlanta's SunTrust Banks. "I was shocked that the FDIC did not have IndyMac on its watch list until a month before" its collapse, Cassidy said. "You may have an inexperienced team. ... Remember, for the last 13 or 14 years, the banking industry has been pretty benign." Barr, the FDIC spokesman, countered that the FDIC has "a good mix of experienced staff." He said he's at a loss to explain the unusual level of anxiety among IndyMac's customers. "They knew their funds were insured. ... They still lined up and took their money out," he said. "We've had three failures since IndyMac and they all went smoothly." He said the FDIC and other regulators were also aware of the growing risk level in banks' loan portfolios, and took action. The agencies issued guidance to banks in 2006 to discourage them from making too many loans to home builders and real estate developers, but they had "a very difficult line to walk" at the time, when banks were still prospering from such lending, he said. "I feel that we did recognize it and did what we could," Barr said, but "you don't want to cause a credit crunch." The cycle begins with denial, and ultimately ends up in despair. At first, the company denounces that anything is wrong, but Mr. Market has a way of sniffing out who is imitating Pinocchio. Ultimately, the company ends up in despair when they need/want to raise capital to just be able to function normally, but alas, they cannot because the window of opportunity to raise capital has shut. Let's use Lehman Brothers as the poster child of this sort of behavior. I wrote a piece last week that singled out National City, Washington Mutual and Lehman Brothers. Before the credit crisis started, Lehman, at the time known for its savvy timing, suddenly came to market for $5 billion of long-term bonds when they didn't need capital-or did they know something was awry as I suspect? Last year, with the Credit Crisis in its infancy, Lehman announced a $100,000,000 stock buyback. The shares, as you would expect, popped on the news, but of course no stock was ever re-purchased. As the stock began to sell off, they kept saying that capital was not needed. Then, on June 9, 2008 they sold 143,000,000 shares at $28 per share. As hedge fund manager David Einhorn said, "They've raised billions of dollars they said they didn't need to replace losses they said they didn't have." In between was an enormous preferred stock deal-75,900,000 shares at $25 per share at a rate of 7.95%. Those shares now change hands at $15 per share for a yield of 13.1%. Its pretty hard to turn a profit when your cost of capital is greater than 10%. During this time, in January, the company actually raised its common dividend by 15% year-over-year. They have written off north of $8 billion since the Credit Crisis began and when they release earnings (or lack thereof) next month, estimates are for another round of $2-4 billion of write-downs. They have reportedly been trying to shop $40 billion of impaired real estate and they are mired in all sorts of Alt A, sub-prime, CMBS and CDO's and CLO's. The best part is that they said they "shrank their balance sheet" when in fact they were sold to an "off balance sheet subsidiary" that they own part of. The bonds weren't sold, they were just "relocated". I sure wish I could do that when I make a mistake. And lets not forget that the Federal Reserve opened up the discount window to primary/dealers so that they could off-load a bunch of nuclear waste on to the Fed's balance sheet, which now looks like one big hedge fund in drag. And then the SEC temporarily changed short selling rules for 'the Group of 19' (the GSE's and Primary Dealers) for a few weeks, resulting in a short squeeze, but their shares still hobble along at recent lows. On Friday, there was a rumor that the Korean Development Bank would buy Lehman, but again that turned out to be hogwash. And if they wanted to raise debt, like they say, "lotsa luck". Their bonds trade around +500 basis points to treasuries but my guess is that even if they could get deal done, they would have to come in the 10% range, again, uneconomic. * Common stock too low to issue new shares. * Preferred stock yield too high to issue new shares economically. * Issuing debt is uneconomic. * More write-offs coming in days to come. * Business trends are awful. Now that we have identified the "poster child", let's find a few more... Or sadly, more than a few. * Equity has traded down from $75 to $25. * Tried to issue a $200 million preferred stock offering at 9.5% but only was able to sell $47 million. * Their debt trades in the open market approximately 1,000 basis points above Treasuries, IF you can sell them, or 13 14%. * They are geographically in Utah, but spread out to Florida, Nevada and Arizona at the top of housing to take advantage of great opportunities. * They say they need $200-300 million capital. Good luck. * They maintained their common dividend. * Common Stock has traded down from $40 to $11. * Preferred Stock trades at 13%. * Debt trades in the market at 10-11% dividend. * Cut dividend in half in July, still yields 6.5% even while they lose money. * Equity has traded down from $60 to $14. * There are no preferred issues outstanding. * Debt trades in 10-11% range if you can sell it. * Cut dividend by 75%. * Equity has traded from $40 to $3. * No preferred outstanding except convertible preferred. * Debt trades in the 20-25% range. * Cut the dividend to $0.01 per share in April. * Has admitted they will lose money for the next several years. * Equity has traded from $40 to $5. * Preferred stock trades at 13-15%. * Sold a huge amount of shares at $5 per share in April. * Cut dividend to $0.01 per share in April. * Equity down from $40 to $8. * Preferred Stock Trading at 10%. * Debt trades in the 10-11% range, if you can sell it. * Cut dividend by 75% in June. * Needs to raise $2 billion, according to Sanford Bernstein. * Equity has traded from $80 to $10. * Preferred stock trades in 18% area. * Short-term debt trades in 25-30% range. * Long-term debt trades in 17% range. * Eliminated common dividend in July. * Equity has traded from $60 to $4. * Preferred stock trades in 16-17% range. * Long term debt trades in the 18-20% range. * Eliminated common dividend in September. * Equity has traded from $60 to $14. * Issued a $3.5 billion "hybrid security" in February that now trades at 11%. * S&P has stated they cannot issue any more hybrids. * Sold 92,000,000 shars of a preferred stock in December at 8% that now trades $18 or 11%. * Cut common dividend twice since February to $.05 a share or 90%. * Debt trades at 9.5-10.5%. * Equity has traded from 60 to 9. * Preferred Stock trades in 12% range. * Outstanding debt trades in 12-14% range. * Cut common dividend by 66%. * Sold 91,000,000 shares of common at $11 in April 2008.
Who are in the "Limping but Not Dead Man Walking Crowd"? I am certain that I have missed a bunch of names on the "Dead man Walking List", but the pattern is rather easy to discern. As I stated early on, when we have one or two firms in trouble, we can deal with it. But when we add rising unemployment, explosive debt growth in recent years and non-performing assets to many hobbled financial institutions with trillions of dollars of exposure, it is hard not to be concerned. For this reason, we remain cautious towards credit, expect a hard sell-off in stocks into 2010, consolidation in the financial services industry and some pain, like it or not. I am just not sure where the capital will come from to bail everyone out simultaneously. And even if the capital showed up, it would likely come at a cost that is uneconomic and would likely be dilutive for many years to come. It is why we expect much lower than consensus earnings across the board and lower stock prices ahead. In the meantime, we sit with our historically cheap GNMA's at the widest spreads in 20 years and continue to add to that position. In the meantime we position our portfolios so that if we are wrong, the most we can lose is opportunity, not precious capital. I want to buy some 6 month T-bills. I now use TD Ameritrade as my primary broker. They seem to be in pretty good shape right now. Stock price has been stable. But can a private citizen buy these things directly from the US treasury in their own name like they can in Germany? I know you can buy savings bonds, but I have no use for them. Thanks. Check out Treasury Direct. You don't get the satisfaction of actually owning a piece of paper with your name on it, but it's the next best thing. People & Power - Rigged Markets: A reminder from Max Keiser. A bit dated, only last year, pre- bear market and Fannie ‘n Freddie. The Debt Rattle today, reminds of the first one I read, from March 9: The Game is Over. I didn't quite understand it then, it makes so much sense now. Thank you ilargi and stoneleigh for blogging and sharing your wisdom to help us prepare. Thanks citruskid and bigelow for the Treasury Direct link. I checked it out, Could you indicate why holding treasuries in their account would be more secure than with TD Ameritrade? Seems pretty much the same thing to me. I already have an account with them and am satisfied - no problems. But obviously, buying treasuries, particularly real negative interest bills, is a quest for the greatest safe harbor. So why are they safer? Your broker is an intermediary between you and your assets. Treasury-direct acknowledges its obligation to you. No fee accounts up to $100K if I remember right. There are no fees with online TreasuryDriect. Do you still think the stock market (well the Dow that is) will pop up above 12,000 before the year's end? I see the fear in the financial media increasing. It is not hysterical, and I don't think it will be until after a large drop, but it does seem the fear is more palpable now. I guess all those lies about containment and no need for further capital are beginning to sound hollow to more and more people. el pollo, you say "I know you can buy savings bonds, but I have no use for them. Thanks." Mind expanding on that, is it the length of time necessary to hold them that is the sticking point? About Peru , sounds good despite those 'drawbacks' you mentioned, particularly today as I just got back from a ride on the B.C. ferries to Vancouver - for the day. Astounding how popped from a corporate mould it all is getting to be out there. (I spend most of my time at home either in the garden or painting so don't get away much). I also stopped in Chinatown for lunch and that was less disturbing, much poverty in that area but very vital and alive. The salt still has it's savour there. "el pollo, you say "I know you can buy savings bonds, but I have no use for them. Thanks." Mind expanding on that, is it the length of time necessary to hold them that is the sticking point?" Totally. Stoneleigh says to stick to bills, as opposed to notes and bonds. Stay fluid - short term. I tell my friends and relatives to worry about the return of their money - not the return on their money. Starting to feel like a cross between Jeremiah and Noah. Still have half my savings in German 5 year treasuries in a UBS portfolio. Been trying to move them to my own account with the Schuldbuch, the Debt Regestry for the last 2 months ever since Francois tipped me off that it was possible. Making progress and getting close. As to a "third world," retirement, all I have to do is listen to the idiots on C-Span call in for 10 minutes in the morning to lose any sense of nostalgia for the USA. There are a lot of noxious gases in the belly of the empire, and things are about to get worse. So the question comes up, "Would you rather live a modest but comfortable "senior" existence in a third world country or eat squirrel in a trailer park in Arkansas?" I love high mountains, and I spent time in a wonderful little city in the Indian Himalayas in 2001, also surrounded by 20,000 foot peaks with a trout river running through it :-) About 100 miles west of the Tibetan line, named Menali. It's #2 on my list. My late father's first language was German - it gives me a perspective on this. Actually a trout filled river runs down my Eastern property line, the only problem is the rest of my surroundings are filled with people who have been living the good life, high on the debt hog. I think, as long as one speaks the language and understands the culture, a move to a country that is closer to the earth than we are could be very wise, pretty hard to fall off of the floor. Otherwise happiness might still be a warm (squirrel)gun even in that trailer park.I imagine you have seen expat communities, like I have in Mexico, they seem so sad as they can't go home and they really just don't fit there. You think you have problems in Cassadraville? Up here they just squirt Canadian oil in my eyes and say, "pass the commodities, it's dinner time in Canada". My plan involves a small permiculture farmett,at the end of a dead end road...few neighbors,in the only part of the us that appears to be headed in the right direction.Plan 'b' may involve a small sailboat and becoming a permanent wanderer. None know how this is going to shake out. "youse buy your ticket and youse takes your chances"right? Smile at a friend,hug your kids,and get some laughs in....there may not be many in the future. Hi Snuffy, don't know which coast you are on but on your plan A and plan B why not combine them? I have a small city farmette and when the SHTF for real up here on the West coast of Canada I think I will be able to pick up all the sail boats up here I need for an ounce or two of the gold all of us doomers keep in the sock tied to the bedsprings. If the Visigoths and Vandals come screaming down that dead end road we grab our long-lines and jiggers high tail it down the secret woodsy path to our vessel. Of course there could be one flea in that ointment and that is you get a real bad day when you got the Visigoths at the front door and the Viking hoards coming from the back.